MarineCaMg+ can boost lateral branching, and speed up cell division increasing overall plant growth rates. Marine CaMg+ contains added Nitrozyme and is very efficient at instantly treating deficiencies in N, Ca, Mg fast, in as little as 24hrs. 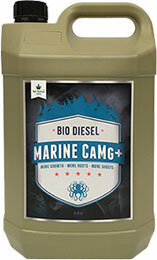 Marine CaMg+ is most suited to Coco Fibre and Hydroponic systems but can also be used less frequently in soil or as a foliar spray to 'green up' plants when required.